But with just 137 bhp on tap from its 1997cc EW10J4 engine, few would deny that the 1125 kilo 206 needs added urge to help it live up to the expectations of a GTi badge. That said, the biggest problem with upgrading the 206 GTi at present is that there’s a huge gap in the engine tuning market between an affordable remap and an expensive, noisy and uneconomical independent throttle body conversion – something that Cat Cams is seeking to try and fill, with its ‘Sport’ fast road cam profiles for the EW10J4 motor. Designed as a profile for everyday driving in all conditions, the Cat Cams ‘Sport’ cams – part number 4901613 - are produced with modest increases in valve lift and duration, in order to strike the right balance between driveability and performance. Cat Cams has also placed a great emphasis on ensuring that the standard road friendly idle characteristics are maintained. A straight swap for the original equipment 206 GTi camshafts, the Cat Cams 4901613 profiles are CNC ground from fresh castings and are directly compatible with the standard Peugeot hydraulic followers. 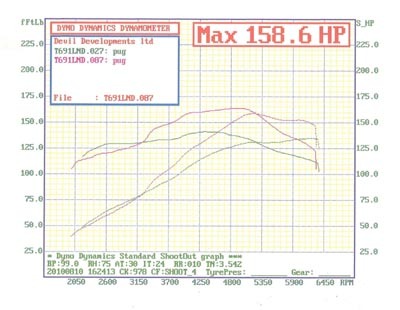 Dyno testing has proven that in conjunction with an ECU remap (or piggyback ECU) to optimise the air / fuel ratio, the Cat Cams 4901613 profiles deliver a peak power increase of up to 23 bhp at just 5500 rpm. Combined with the retention of the 206 GTi’s much praised low speed torque, the Cat Cams profiles greatly extend the cars usable power band, making the Peugeot not only noticeably quicker, but considerably more user friendly as well. Peak torque increases by up to 24 lb.ft up to 165 lb.ft, with over 150lb. ft available from 3750 to 5500 rpm, making the cams ideal for relaxed, rapid, fast road use. And this extra performance is designed to be accessible to all Peugeot 206 GTi fans, so the Cat Cams 4901613 profiles are priced at just £475.87 including VAT @ 17.5%. For further information and sales advice please contact Cat Cams UK or your nearest Cat Cams dealer. NOTE: These profiles also suit the 2.0-litre EW10J4 powered Citroën Xsara and C4, plus the Peugeot 206 CC, 206 GT and the 307 Sport. An alternative pair of ‘Sport’ profiles, designed for the track day market and carrying part number 4901614 is also under development. They will be launched into the UK market in the next 2-3 months, featuring extra lift and duration on the inlet cam for increased top end power.